Allegra distributes industry-leading orthopaedic solutions for Hip Surgeons, including LINK, Signature Orthopaedics and jri Orthopaedics. The Furlong Evolution Hip is suited to young adult patients. Anatomic neck shaft angles and optimised neck geometry – increases the range of motion. Modular, cementless and cemented prosthesis for hip joint revision The MP® reconstruction prosthesis is designed for the replacement of loosened hip prostheses with extensive proximal femoral defects, which no longer permit implantation of standard prostheses. The different prosthesis components form a modular system consisting of a prosthetic head, stem, tapered neck segment, spacers for equalizing leg length and an expansion bolt. *BIOLOX® forte and BIOLOX®delta are products of CeramTec GmbH, Plochingen, Germany. The high modularity of the MEGASYSTEM-C® allows partial bone replacements both in the proximal and distal femur in small increments as well as a total replacement of the femur. For knee joint replacement, implants of the knee joint system Endo-Model® and Endo-Model® SL® are integrated into the MEGASYSTEM-C®. Implant for bridging larger bone defects The Endo-Model® partial pelvis replacement prosthesis provides a cemented option with an artificial hip acetabular cup in cases of extensive osseous destruction, where normal hip acetabular cup systems cannot be implemented, because of a tumour, or earlier interventions. The LINK Endo-Model® partial pelvis replacement prosthesis can be combined with different LINK hip prosthesis systems. The prosthesis stems of the Standard C system are made of alloy steel FeCrNiMnMoNbN (M30NW). Available in standard (CCD 134°) and lateralized (CCD 131°, + 5 mm offset) forms. The CombiCup R® revision cup is a modular cementless system for revision of acetabular implants where reconstruction of anatomical conditions is not possible with standard components, due to adverse situations such as dysplasia or insufficient bone quality. *BIOLOX® delta is a product of CeramTec GmbH, Plochingen, Germany. Hip acetabular cup system for cementless implantation The CombiCup® system optimizes the interoperative process with an ergonomic instrument set and facilitated insertion von cup inlays. It achieved excellent clinical results with its increased primary stability, maximized bone conservation and good osseointegration. **X-PE is a highly cross-linked UHMWPE. The cemented IP hip acetabular cup made from UHMWPE (ultra-high molecular weight polyethylene) is suitable for patients who are not candidates for a cementless system, or those who require immediate mobilisation following surgery. Its comparatively deep cup interior design resists luxation. The different designs with and without "snap-fit effect" additionally facilitate adequate implantation for patients at increased risk of luxation. Prosthesis heads made from BIOLOX® forte or BIOLOX® delta Prosthetic heads of this extremely wear-resistant high-performance ceramic material are characterized by minimum material abrasion and excellent biocompatibility. 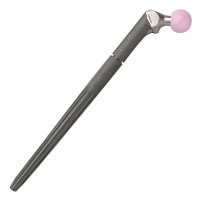 ISO5832-9 dual tapered cemented femoral stem. Press-fit stem full length of stem HA coating to promote biological fixation. Straight and tapered with a lateral chamfer to aid insertion. Both vertical and horizontal grooves to resist axial and torsional loading.